The idea for Wild Daisy was born after Driftwood was spotted by American Quilter Magazine editor, Christine Brown. 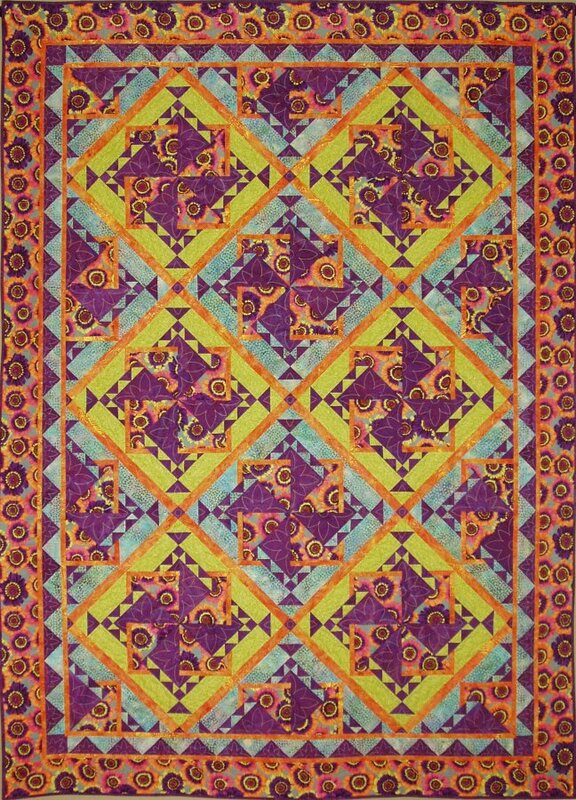 It was hanging in the 2010 AQS Lancaster Quilt Show. I am not known for subtly colored quilts - but Driftwood certainly looked a little dull hanging next to two very brightly colored quilts. "I'd love to publish a brighter version in the magazine", she said. No problem!! While working with American Quilter Magazine's pattern editor, I received the best compliment a pattern writer could ever get! "Your instructions are so complete," she said, "if my dog could read - he could make this quilt!" I guess that's why the pattern for Wild Daisy was published over two issues of American Quilter Magazine - Nov 2011 and Jan 2012! It was even a contender for the first ever public voting for the December issue's cover quilt. It didn't make it - but that's ok. The chosen quilt certainly had a more wintery theme! Wild Daisy is certainly not a quilt for beginners to tackle, but hopefully you will find that the directions are complete! The quilt is pieced except for the small triangles within the blocks, which are paper-pieced. It measures approx. 62" x 86". The focus fabric is Painted Daisies by Philip Jacobs for Westminster Fabrics and is mixed with batiks by who else, but Island Batik!